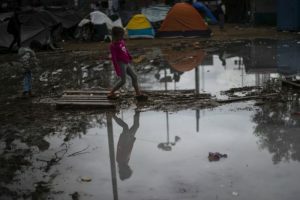 Tijuana (Mexico) (AFP) – Ten Central American women taking part in the migrant caravan camped on the US-Mexican border said Thursday they were starting a hunger strike to pressure American authorities to let them apply for asylum. “Since no one is listening to us, we’ve decided as a women’s movement… to launch a hunger strike,” said Claudia Miranda of Honduras at an improvised press conference in the border city of Tijuana. More than 6,000 migrants who traveled to the northern Mexican city by caravan are camped out hoping to apply for asylum or sneak into the United States, fleeing poverty and violence in their home countries. US President Donald Trump, who has called the caravan an “invasion” full of “hardened criminals” and “thugs,” is seeking to overhaul asylum policy to keep applicants out pending approval. Draped in white flags, the women tried to picket in front of the immigration offices at the border, but were blocked by a heavy police contingent. The women are also calling on Mexican migration authorities to grant speedy humanitarian visas to migrants who want to remain in Mexico. They did not say how long they planned to maintain their hunger strike. After walking and hitch-hiking more than 4,000 kilometers (2,500 miles) to the US southern border, some 500 migrants tried to breach it on Sunday. They were forced back by US Border Patrol agents, who fired tear gas and rubber bullets.